Juston Pollestad and Debbie Crabtree were appointed as Pullman High School principal and assistant principal at the April 10, 2019 Pullman Public Schools board meeting. 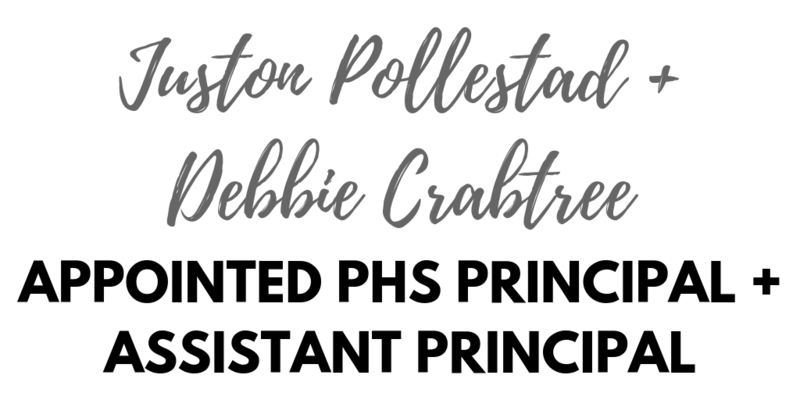 Since the fall of 2018, Juston Pollestad has served PHS as interim principal and Debbie Crabtree has served PHS as interim assistant principal. The Pullman High School staff supported a survey of the staff as a tool to gather additional information regarding the possibility of offering Mr. Pollestad and Ms. Crabtree continuing contracts as principals. The survey was conducted in February of 2019. Both Juston and Debbie received overwhelmingly positive scores and comments, suggesting appointment of both Juston and Debbie to be the continuing principal and assistant principal as an appropriate course of action. The results of the survey were shared with the Board and PHS staff, and all parties supported moving forward with the appointments of Juston and Debbie. Both Juston and Debbie have been through administrative interviews previously for building administrative positions with positive results. They are familiar with district and building initiatives, procedures and are currently involved with the development of new courses and programming for next year. 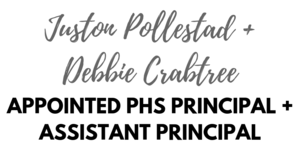 In addition to incredible support shown by PHS staff, these appointments will provide continuity and allow current PHS projects to continue without taking a pause or delay.